To add your email account to the latest version of Microsoft Outlook first click on the File menu and then on Account Settings. If you're using the Mac version, the menu will be in Outlook -> Preferences -> Accounts. No matter which OS you're using, the main configurations steps are the same. To begin, click on the Other Email button at the bottom of the page. Next, Microsoft Outlook will ask you for the email you want to add and the password for it. Once you start typing, additional fields will appear allowing you to configure the sending and receiving server for your emails. Once you fill in each field/checkbox, click on the Add Account button to proceed. That's it! 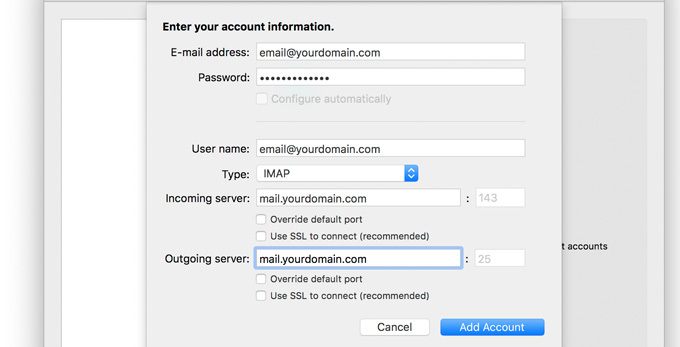 Your email account is configured and you can start sending and receiving emails.